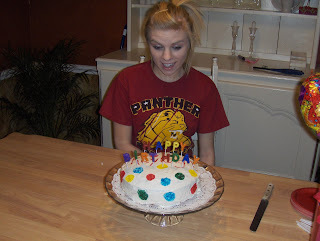 Look who's 15! 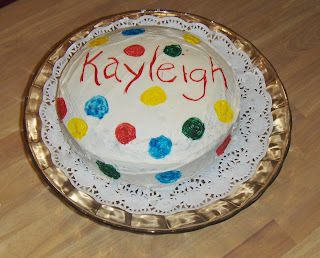 My sweet Kayleigh turned 15 yesterday! 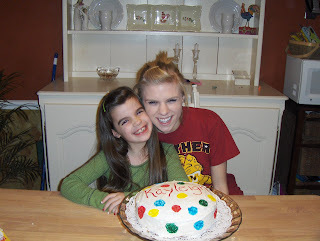 She's growing up too fast! 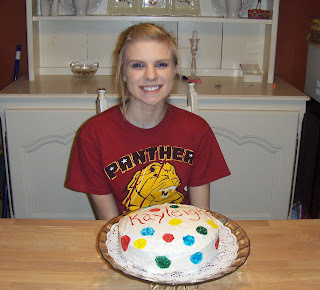 Maddie and I baked and decorated a cake for her. I made whatever she wanted for dinner and she chose potato soup. I also made tuna patties and peas to go with it. Kayleigh just ate the soup, two servings actually! 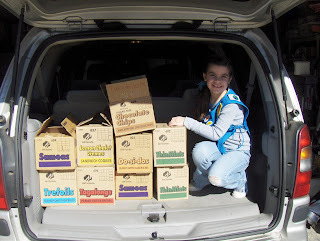 Kayleigh is my picky eater but when she likes something she really likes it! And it usually has potatoes or pasta or chicken! Kayleigh wants to go to the movies with a few friends as her party. It seems strange not to be planning a party for her but she is 15 and she knows what she wants to do. Oh well, there's always next year...sweet 16!! Surely I get to plan a party for that! She couldn't believe she got them all in one blow! Yesterday we brought Fletcher home for his birthday celebration. He's never celebrated his birthday in our home. What a wonderful day! 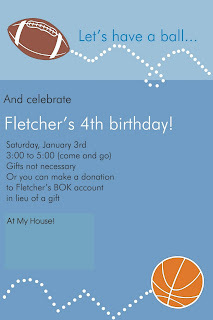 We had over 60 people come join us in celebrating the gift of Fletcher! It was amazing! We had friends from Tulsa, family from Houston and a friend from Alaska. Pretty cool, huh? This year as I thought about a theme for Fletcher's birthday I asked myself, 'what does Fletcher love?' Well he loves a lot of things but he has a passion for balls! Foot balls, base balls, soccer balls any thing he can throw is a jackpot for him! So, I decided on a ball theme and it turned out great! 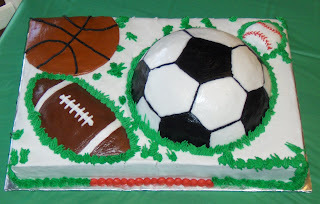 A friend of mine made this incredible cake that had a foot ball, base ball, soccer ball and basket ball on it. It was so cute! 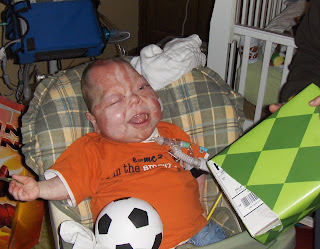 He loved opening packages. When Fletcher was home on Christmas I tried to get him to sit in his high chair. Well, that went over like lead balloon. I thought he'd enjoy sitting up and seeing everything around him. He hated that highchair and did not sit in it all day. I was determined on his birthday not to let him lay in bed all day. So, I put him in the highchair and he fussed at first but somehow he got distracted and I don't think he remembered he hated the chair! He stayed in it for probably 2 hours! Our friends were able to see him action and he could see everything and everybody! We want to thank all you who came to the party and those of you who wanted to but couldn't. Our lives are forever changed because of Fletcher, as I know your lives are also. Thank you for being the body of Christ to our family these past 4 years. Though we've had our ups and downs the Lord has shown Himself to us so many times and in so many ways and through so many of you! Thank you, thank you, thank you for loving my family the way you do! Be blessed, be a blessing!